Developing the menu and……the venue! It’s hard to imagine and plan a menu celebrating Spring when it’s blowing a gale outside but I’ll do my best and perhaps even will the sun to shine. Early contenders for inclusion are asparagus – I’m thinking blanched then chargrilled and finished off with some fruity olive oil and shavings of tangy, piquant “Kelly’s goat” from the fabulous and talented Cheesemakers of Canterbury. 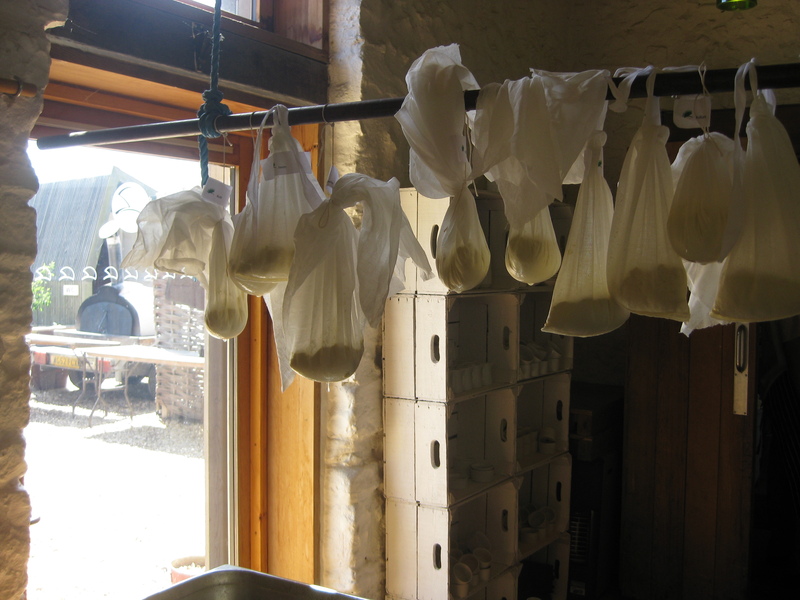 You can see a film all about their cheesmaking on their site which reminds me of a rather sunnier May last year when I learnt how to make cheese at River Cottage which may feature on a future menu. Also high on the list, slim fillets of mackerel grilled under a high heat, skin crisp and served with gooseberries, compote or mildly pickled. Looking at my gooseberry bushes they will have to be sourced from further afield than 50 yards from the back door. Alternative fish thoughts include soused herrings, brown trout, skate cheeks ….and so it continues, A trip to Bluey in Oare is in order to see what’s looking good before I fix the menu. On to the meat course. It has to be Spring lamb, but will it be a saddle, slow cooked shoulder or sweet cutlets with a salsa verde? More testing and tasting needed. Pudding I think is pretty settled, a wonderful light macaroon cake by Tamasin Day-Lewis accompanied by the sharp pink stems of rhubarb straight from the garden, poached in a ginger and spice syrup. Let me know what you think and if you’d like to be there and I’ll make sure you hear first when booking opens. May 26th, 7pm. Faversham, after hours in the cafe at Macknade Fine Foods. With thanks to Stefano Cuomo.